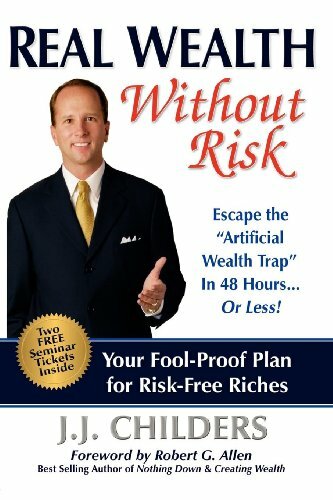 J J Childers Real Wealth Without Risk: Escape the ""Artificial Wealth Trap"" in 48 Hours...or Less! Real Wealth Without Risk: Escape the ""Artificial Wealth Trap"" in 48 Hours...or Less! Your Fool-Proof Plan for Risk-Free Riches.The ""Artificial Wealth Trap"" has taken countless people captive. In this extraordinary new book, attorney and personal financial strategist J.J. Childers teaches anyone, no matter what your current financial situation, how to give yourself a ""Financial Facelift"" in 48 hours or less by following his Wealth E.S.C.A.P.E. Plan. In this book you will learn how to make the great E.S.C.A.P.E. by learning dozens of strategies in each of the following areas: *Envision *Strategize *Create *Accumulate *Preserve *Execute This book contains hundreds of time-tested, easy to follow, common sense strategies for proven financial success. Building a secure financial future for yourself takes time, effort and energy. You can do it as long as you know the strategies. J.J. Childers has helped thousands of people just like you get their financial lives together. He's done it for them, he can do it for you. J.J. Childers is an attorney dealing primarily with the topics of asset protection, estate planning, tax reduction, small business, and personal financial matters. He travels the country extensively working with individuals, companies, and small businesses to help them with their wealth creation, accumulation, and preservation strategies. He is actively involved in real estate and is the owner and operator of a number of businesses. Through the dynamic courses that he teaches, anyone can learn the strategies for creating, accumulating, and preserving vast amounts of wealth. He has worked with some of the leading financial strategists in the country including Donald Trump, Robert Allen, Mark Victor Hansen, Denis Waitley, Marshall Sylver, Armand Morin, and others. Escape the ""Artificial Wealth Trap"" in 48 Hours...Or Less! -- Robert G. Allen ""Best Selling Author of Nothing Down & Creating Wealth""
1. Real Wealth Without Risk: Escape the "Artificial Wealth Trap" in 48 Hours. or Less! 2. Real Wealth Without Risk: Escape the "Artificial Wealth Trap" in 48 Hours.or Less! 3. Real Wealth Without Risk: Escape the "Artificial Wealth Trap" in 48 Hours.or Less! 4. Real Wealth Without Risk: Escape the "Artificial Wealth Trap" in 48 Hours. or Less! 5. Real Wealth Without Risk: Escape the ""Artificial Wealth Trap"" in 48 Hours...or Less! 6. Real Wealth Without Risk: Escape the "Artificial Wealth Trap" in 48 Hours.or Less!